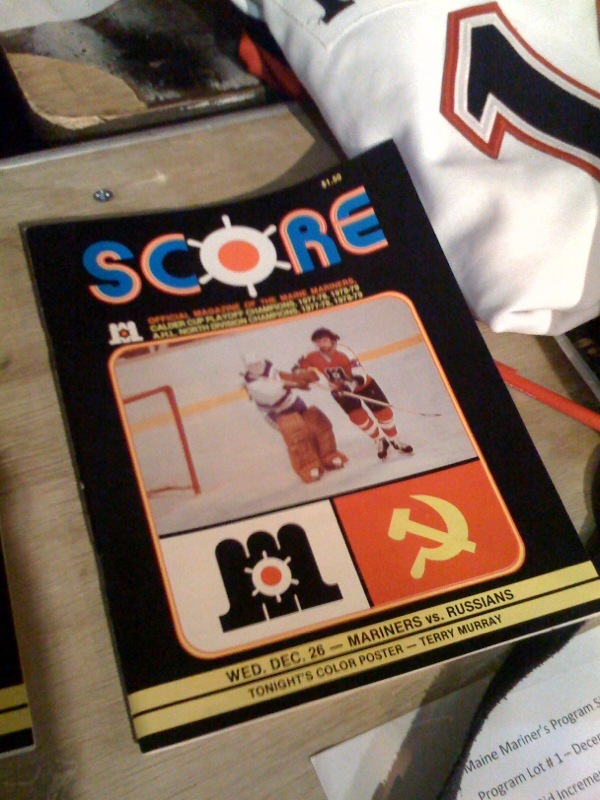 The game program from the international match featuring the American Hockey League’s MAINE MARINERS and a team officially designated as the MOSCOW SELECTS on December 26, 1979 (above). The color poster given away on this occasion was none other than former National Hockey League rearguard TERRY MURRAY, then the two-time reigning Eddie Shore Award winner as the AHL’s top defender and nowadays the AHL’s newest head with the doomed Adriondack Phantoms. This particular event also marked a third consecutive year on the trot that the Philadelphia Flyers’ top farm club hosted a touring team from the former Union of Soviet Socialist Republics just after the Christmas holiday. The cover photo of this particular game program is actually from the the MAINE MARINER’s historic meeting with visiting Soviet squad DYNAMO MOSCOW two years earlier. It was on that occasion — December 29, 1977 — that a record crowd of 6,726 spectators jammed the Cumberland County Civic Center in Portland to witness to local the AHL team and an ice hockey squad from the mighty U.S.S.R. drop the puck up close and in-person. A thrilling, one-goal match that was only settled in the final period and, reportedly, elicited a loud standing ovation — meant for both sides — from the appreciative crowd upon its completion. The classic cover exhibited above shows bearded Maine Mariners forward PAUL EVANS (22), the productive 23-year-old center who had scored 50 goals in 78 games for the Saginaw Gears during the 1976-77 International Hockey League season and had arrived from the AHL’s Springfield Indians early into the 1977-78 campaign to complete an earlier trade which had seen the National Hockey League’s Philadelphia Flyers trade American-born winger Steve Short to the Los Angeles Kings, skating by Dynamo Moscow’s on-loan and destined-to-become-’famous’ goaltender VLADIMIR MYSHKIN. Dynamo Moscow, the Ministry of the Interior (which included the notorious K.G.B.) squad who still always finished among the top three or four clubs annually in the domestic league table despite having last won a Soviet elite league championship nearly a quarter century earlier in 1954, were actually missing a dozen players plus head coach VLADIMIR YURZINOV for the international contest with the Mariners in Maine. Five of Dynamo Moscow’s regular skaters, including two-time Olympic gold medalists ALEXANDER MALTSEV and VALERY VASILIEV, in addition to Yurzinov were with the senior national team of the U.S.S.R. in Tokyo, Japan, for a three-game exhibition set with the professional Winnipeg Jets of the World Hockey Association. Another five Dynamo players, including goaltender SERGEI BABARIKO, had already been in North America since mid-December with a national select team known as the Soviet All-Stars and were in the midst of a ten-game series with WHA clubs. On top of that, still another Dynamo pair were currently celebrating in Quebec City with the Soviet squad that had just defeated WAYNE GRETZKY and host nation Canada 3-2 at the second-ever IIHF World Junior Championships. 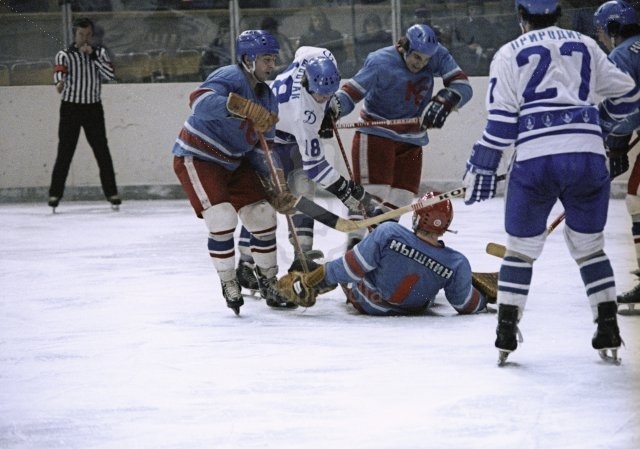 Dynamo Moscow center MIKHAIL SHOSTAK (18), a member of the U.S.S.R. squad that won the very first official installment of the IIHF World Junior Championships in 1977, has a whack but cannot get the puck past goaltender VLADIMIR MYSHKIN (1) of air force club Soviet Wings during an elite league match at the well-known LUZHNIKI PALACE OF SPORTS of the CENTRAL LENIN STADIUM at the GRAND OLYMPIC SPORTS COMPLEX in the capital city of the Union of Soviet Socialist Republics; looking on is high-scoring Dynamo Moscow right wing PETR PRIRODIN (27), who never did get much of a chance with the U.S.S.R. senior side but still managed to post an impressive eight goals in eleven games with the national team. Myshkin, a 22-year-old “puck tamer” who initially excelled with lowly Kristall Saratov and was now enjoying his first season in the capital city with air force outfit Krylja Sovetov (Soviet Wings), was just one of several players drafted into service by Dynamo Moscow to fill out the ranks for the North America trip. The Dynamo defense did have three veteran regulars on hand for the memorable match with the Maine Mariners who had, in fact, previously appeared with the U.S.S.R. national team. 26-year-old ALEXANDER FILIPPOV and 22-year-old VALERY FILIPPOV both already held the coveted title of “Merited Master of Sport” in the Soviet Union having won gold medals at the annual IIHF World Championships in 1975 and 1976, respectively. And experienced 29-year-old VLADIMIR ORLOV had made six appearances for the Soviet nationals five years earlier, as well. 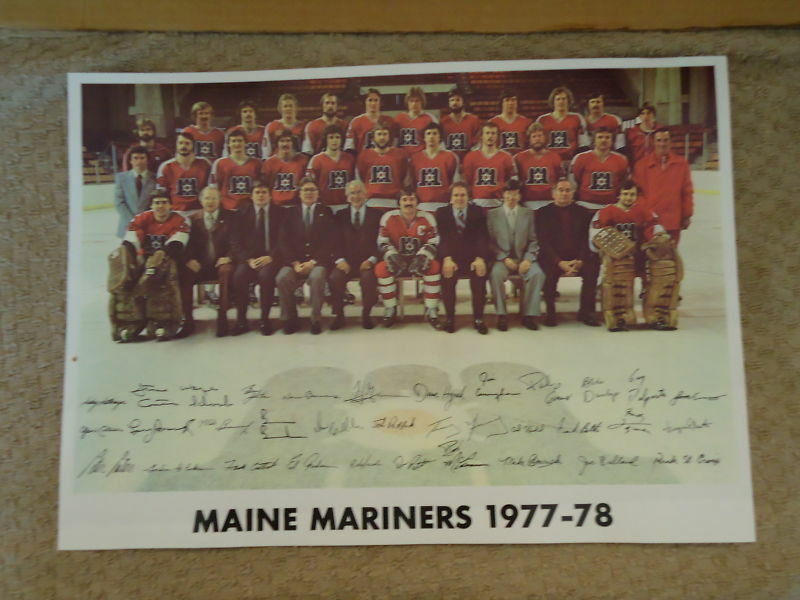 The Maine Mariners, meanwhile, were in their very first year of existance but this would not stop the club from storming to the best regular season record and then the Calder Cup title — official symbol of American Hockey League supremacy — on its inaugual skate in the established circuit. The original Mariners featured a pair of reliable goaltenders in future NHL performers PETE PEETERS and RICK ST. CROIX as well as would-be short-lived Philadelphia Flyers blueliners FRANK BATHE and MIKE BUSNIUK. A surprise standout on defense for Maine would prove to be Iron Curtain defector RUDOLF TAJCNAR, the portly 29-year-old who had, in 1972, first earned the Olympic bronze medal at the Sapporo Games and then claimed the IIHF World Championships title in Prague with the national team of Czechoslovakia. The Mainers boasted a pair of the parent Philadelphia Flyers’ recent 2nd round NHL draft picks in DREW CALLANDER and rookie American-made right wing TOM GORENCE, a 20-year-old who had just left the University of Minnesota after his sophomore term, on their maiden voyage. The AHL’s newest club benefited from the presence of former Minnesota North Stars second round draft choice BLAKE DUNLOP and LARRY ROMANCHYCH, a 27-year-old, former second round selection of the Chicago Black Hawks who was by now a veteran of almost 300 NHL games with the expansion Atlanta Flames. It was, oddly enough, undrafted second-year center AL HILL who would go on to finish third in the whole league with 91 points scored while skating in all 80 AHL games for the fledgling Maine Mariners. New Adirondack Phantoms head coach TERRY MURRAY, who led all Maine Mariners defensemen in scoring with 49 points (9 go, 40 as) during the expansion team’s highly-successful 1977/78 American Hockey League season, is the fourth player from the right standing in the second row for the Philadelphia Flyers’ top farm club of that era … the captain for the 77/78 Calder Cup champion side is defenseman DENNIS PATTERSON, the journeyman 27-year-old who contested 135 NHL games for the ill-fated Kansas City Scouts and another 23 contests for the Edmonton Oilers in the World Hockey Association before coming to the New England city of Portland, Maine. The 24-year-old Dunlop (62 ga, 29 go 53 as, 82 pts) would ultimately be rewarded with the Les Cunningham Award as the AHL’s regular season Most Valuable Player and, as were Hill and defenseman TERRY MURRAY, named first team AHL All-Star to cap off the 1977/78 schedule. In the meantime, for more than forty minutes, neither the would-be AHL champions or visiting Dynamo Moscow, who were on their way to a second place finish in the Soviet elite league standings for a second consecutive year, could find a way to light the lamp in Portland. The form of neither St. Croix (23 saves) nor Myshkin (32 saves), who was still a year away from facing the Flyers at the Spectrum in Philadelphia with Soviet Wings, would allow for that. Finally, seven and a half minutes into the third period, Callander – the 21-year-old from the western Canadian junior ranks who would lead the original edition of the Maine Mariners with 40 goals during the AHL regular season – ended the stalemate after approach work from Evans and defenseman GUY DELPARTE.